Cruelty, cover-ups, corruption. 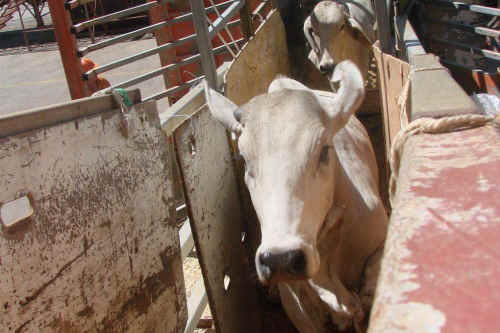 Whichever way you look at it, live export is a crime against animals. ‘Tough Australian regulations’ mean very little when animals are still being beaten, stabbed, and brutalised. They mean even less when those responsible for cruelty are permitted to reoffend without sanction. Don’t let the suffering of these animals be in vain. Use this form to send an instant message on their behalf today. Please visit Ban Live Export for more information about Australia’s grisly live export trade and to find other ways you can help end it. TTV journalist Jane Velez-Mitchell speaks to Tanya Hardy, a veteran activist in Australia, about the deal with China and the cruelty of live exports. The leader of the exporters’ group, said that all animals exported from Australia were closely tracked and that there were strict regulations about their welfare before export, during shipping and even after they landed in a foreign country. The regulations were tightened after export bans were imposed after accusations of cruelty in some Indonesian slaughterhouses.